In working on Frontline, it is important for us to involve you as much as possible, to deliver the best overall experience upon release. That’s why we want you to become part of the process by playing and giving feedback on potential adjustments. But before you do, take a few minutes to study Frontline’s basics. With bigger maps, larger teams and a whole set of new mechanics, Frontline promotes intense action, tougher decision making, and closer team coordination. To help you hit the ground running we’ll guide you through its every element, making the testing process equal parts fun for you and helpful for us. Vehicles: All Tier X medium/heavy tanks, TDs and SPGs and Tier VIII light tanks (NOTE: the latter is a temporary restriction caused by the technical nuances of testing. Eventually, the mode will switch to Tier X vehicles of all classes). Teams: 30 players on each side with an opportunity to team up in Platoons of five. Roles: One team plays in defense; the other attacks. In addition to the base capture point, each map sector hosts Repair and Resupply Zones. Each member of the team that is controlling the sector with the Repair and Resupply Zone can replenish the hit points and repair the modules or resupply the ammunition of the vehicle. Shells and Consumables are resupplied in the same manner as upon a respawn—the standard shells and Consumables are resupplied automatically, while the premium ones resupply only if they are available at player’s Depot. After the vehicle has restored 100% of its hit points, the Repair and Resupply Zone becomes unavailable for 2 minutes for the player. If the player’s vehicle is damaged during repairs, the repair and resupply process is stopped for 20 seconds. An area in the map where the attacking team should gain control over a particular front. The standard mechanic of base capture is used: once the attacking vehicles enter the circle, the front capturing is started. The more vehicles are holding position within the base circle, the faster the front is captured (the maximum capture speed is achieved with 5 vehicles within the circle). The front is captured when the allied vehicles have earned 100 base capture points. Once a vehicle is destroyed, it can respawn in a special area of the map—the Vehicle Respawn Zone. For the defending team, the respawn zones are available on the fronts controlled by the team. The attacking team can respawn on controlled fronts, as well as in the deployment zone, which is located in the south part of the map, and usually the most deployment-heavy in the beginning of a battle. Objectives: Attackers must break through defensive fronts and destroy at least three out of five pillboxes (explained in more detail further down). Defenders must hold strong and keep at least three out of five pillboxes intact. Battle duration isn’t fixed. Initially, attackers are given 12 minutes to break through and destroy pillboxes. Each successful base capture on the 1st defensive front grants you an additional 2 minutes to complete the mission, while capturing a base on the 3rd defensive front gives you 2.5 minutes. If the defending team stifles an offensive right away, the game ends in the first round. All in all, battles can last from 5 to 20 minutes. Once attackers succeed in capturing a segment, it becomes their territory. They can continue the offensive, advancing on the 2nd defensive front and beyond until they reach the 3rd front. The other team must leave the captured area within a minute. And they’d better be quick—all defending tanks are instantly destroyed 60 seconds after base capture. Don’t get overwhelmed when playing attack, and remember that landing on the 2nd front before you get hold of at least one segment in the 1st front will also result in instant destruction from an AI airstrike. As soon as attackers reach the 3rd front they can embark on their primary mission and destroy pillboxes, which are long-range guns, each with their own HP pool. Pillboxes are protected by armored hoods and virtually impenetrable from head-on. Aim at their rear where there is significantly thinner armor, or better yet, come prepared by studying their armor scheme beforehand. It would be pretty frustrating to get destroyed or run out of shells in the course of a massive tank battle, don’t you agree? But fear not. We’ve got you covered. You’ll have several lives for each stage of the battle. Attackers begin with two, while defenders have just one, and each player receives an extra “life” every 5 minutes, with a maximum of three lives at a time for every tanker. It gets a bit trickier should attackers capture all six bases across the 1st and 2nd defensive fronts. In that case, defenders play a now-or-never game, left with just one life each. There are also special spots scattered across the active combat area where you can restore your HP pool, repair modules, and replenish ammo. 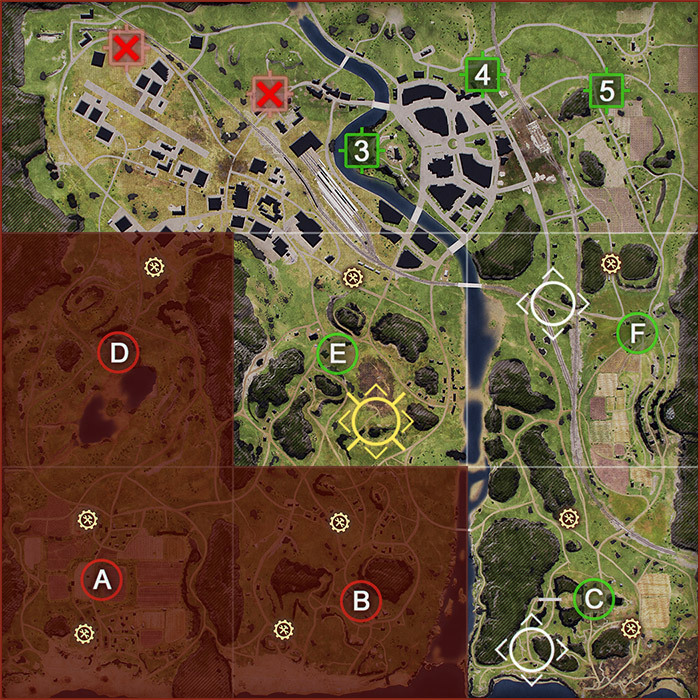 There is one spot for both repair and resupply on each map segment. These zones can only be used by the team that controls the segment. Just as with respawning, Premium rounds and consumables are only replenished if you have them in the Depot; regular ones are replenished automatically. Keep in mind that zones have a cooldown time. So, once you have repaired your vehicle to 100%, you’ll have to wait 120 seconds before you can use it again. The cooldown is counted for each player individually, which means that several vehicles can use it at the same time. If you happen to get hit while in a Repair and Resupply Zone, you must wait another 20 seconds to stock up on rounds and finish repairing the vehicle. A great battle performance (capturing a base or resetting the cap counter, damaging/destroying enemy tanks) will earn you special ranks. And you can earn several of these ranks within one battle, levelling from Private all the way to General! If what you’ve just read has you excited, apply to join the test. Once in the Sandbox, all you have to do is choose “Frontline” in the mode dropdown in the Garage (to the right from the “Battle!” button). ONE IMPORTANT NOTE: Frontline’s economic system is a work in progress. Our primary goal with the 1st round of the Frontline test is to gather feedback and stats on gameplay, new mechanics, map structure, etc., and to define how we should tweak them going forward. After that, we’ll get down to tuning the mode’s economics. Have fun exploring the mode, and be sure to share your thoughts with us. They will be instrumental in determining whether Frontline has a potential place in World of Tanks going forward and how we should evolve it.